Summers in Minneapolis can be hard on air conditioners and, after enough time, they need to be replaced. Trust Ductworks Heating & Air Conditioning to give you the best service at a competitive price when it’s time to replace your air conditioner in Minneapolis, St. Paul, and surrounding areas. Age of unit - Air conditioners can last as long as 15 years but after 10 years they become less efficient. These aging units can leave you with expensive repairs that make replacement a better investment. Energy efficiency - An A/C with a SEER rating below 13 is not very efficient and will cost you extra money to run. Modern air conditioners must have a SEER rating of at least 13 but go as high as 25 so you can cut back on your energy costs by replacing it with a new, more efficient unit. Frequency of repairs - As your A/C ages, the number of repairs and frequency of service will go up. Eventually it makes more sense to replace rather than repair. Rising energy bills – Increases in your monthly bill show your system is taking more energy to keep your home cool. R-22 (Freon) system replacement with R-410A system - Freon is being phased out nationwide out by the federal government to help homeowners conserve energy. Freon is more expensive and eventually you’ll need to switch over to a new refrigerant (R410A) system. At Ductworks we will always do our best to repair your Air Conditioner. 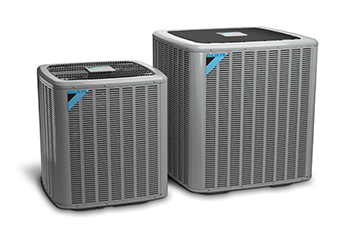 If it needs to be replaced, we carry the full line of Daikin HVAC systems and will work with you to choose the perfect model and size to fit your home. No matter what your financial situation is, your family shouldn’t go without A/C in the summer months. That’s why we offer affordable financing options and we’ll work with you to get you approved and complete your home’s A/C replacement as soon as possible. Click here to learn more about our financing options. *Complete warranty details available from your local dealer or at www.daikincomfort.com. To Receive the 12-Year Parts Limited Warranty, online registration must be completed within 60 days of installation. Online registration is not require in California or Quebec. Call Ductworks today to get a fast and friendly assessment of your air conditioner with the best service in Minneapolis!